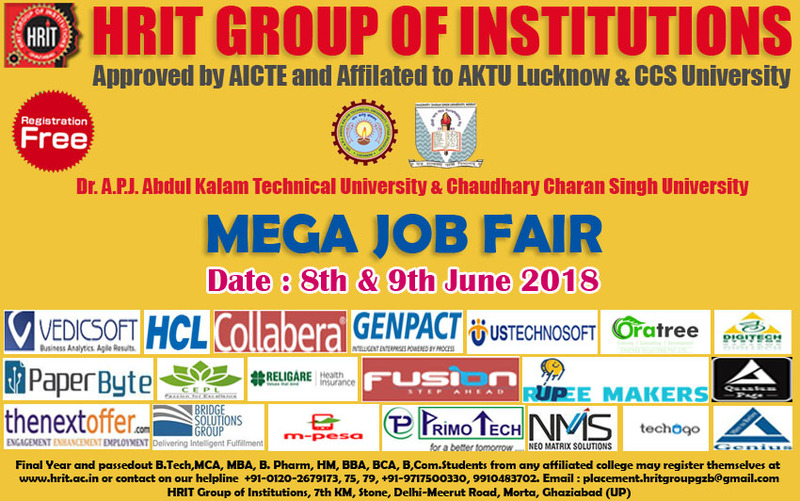 Hrit Group of Institutions is organizing HRIT GHAZIABAD MEGA JOB FAIR-2018 for B.Tech, MCA, MBA, B.Pharm, HM, BBA, BCA and B.Com students on 8th to 9th June 2018. The students of B.Tech, MCA, MBA, B.Pharm, HM, BBA, BCA and B.Com final year and passed out can register their self at Hrit Group of Institutions officially website. There is no registration fee for HRIT GHAZIABAD MEGA JOB FAIR-2018 . Home page of the website will open then click on link Mega Job Fair in HRIT on 8th to 9th June 2018.